Brazil is experiencing among the world’s fastest demographic aging worldwide. This demographic transition is occurring in a context of few resources and great social inequalities. 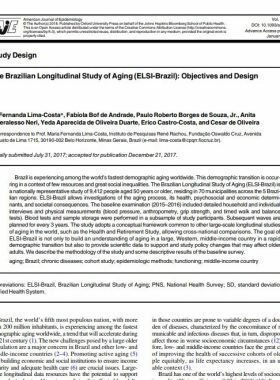 The Brazilian Longitudinal Study of Aging (ELSI-Brazil) is a nationally representative study of 9,412 people aged 50 years or older, residing in 70 municipalities across the 5 Brazilian regions. ELSI-Brazil allows investigations of the aging process, its health, psychosocial and economic determinants, and societal consequences. The baseline examination (2015–2016) included detailed household and individual interviews and physical measurements (blood pressure, anthropometry, grip strength, and timed walk and balance tests). Blood tests and sample storage were performed in a subsample of study participants. Subsequent waves are planned for every 3 years. The study adopts a conceptual framework common to other large-scale longitudinal studies of aging in the world, such as the Health and Retirement Study, allowing cross-national comparisons. The goal of ELSI-Brazil is not only to build an understanding of aging in a large, Western, middle-income country in a rapid demographic transition but also to provide scientific data to support and study policy changes that may affect older adults. We describe the methodology of the study and some descriptive results of the baseline survey.